Funeral services will be at 11:00 am Monday February 4, 2019 at Glencoe-Hokes Bluff Chapel for Patricia Ann Patterson Bowlin, age 74, of Hokes Bluff, who passed away on Wednesday January 30, 2019. Brother Jamie Holcomb and Brother Bruce Jenkins will officiate. Burial will follow at Crestwood Cemetery. Glencoe-Hokes Bluff Funeral Home and Cemetery is in charge of services. 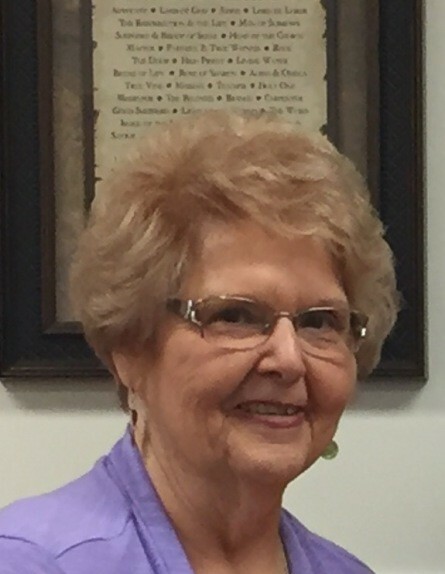 Patricia was a graduate of Hokes Bluff High School, earned a Masters in Elementary Education from Jacksonville State University and retired after 32 years of service at Sand Rock High School. An accomplished pianist she played for Southern Gospel quartets including The Crusaders, and the Evangelaires. Her first pianist job came at twelve years old at Jones Chapel Missionary Baptist Church. She later played for Fords Valley Baptist, Kyle Avenue Baptist, Bachelors Chapel Baptist, and Young’s Chapel Congregational Methodist Church. She is preceded in death by her parents: Frank and Emma Box. She is survived by her daughters: Cassie Patterson, Mindi “Pooh” Patterson, Mandi and beloved son-in-law Eddie Elliott; grandchildren: Caress (Paul) Wellingham, Kendall (James) Smith, Sierra Bussey; great grandchildren: Will, Haley Kate, Conner Wellingham, Baylee, Blakley and James Smith; chosen children: Nicole (Harley) Davidson, Jackie (Corey) Isom, Brandy (Brian) Stovall, Cassie (Kerry) Dodd, and Anna (Brett) Norman; chosen grandchildren: Madeline and Brenley Davidson, Makenna and Lexi Isom, Allie Blanton, Dani Jade, Tripp, and Asher Stovall, Ava and Chloe Dodd, Javin and Kade Norman; beloved aunts: Beatrice Harcrow, Nellie Riley, numerous cousins, nieces and nephews; lifelong and special friends: Trina Burns, Patricia Green, Nancy Newton, Bennie Bates and Deborah Reynolds. Pallbearers will be Will Wellingham, Coner Wellingham, Kerry Dodd, Aaron New, Hunter Holcomb, and Dakota Holcomb. Honorary Pallbearers will be Jerry Burns, Don Graham, and Brett Norman. A very special thanks to Karen Patterson, more than a step-mother to her children, more than a caregiver, and more than a friend. The famiy would also like to thank the Bowlin Family, the Gibbs Family, Cancer Treatment Centers of America, Alacare Hospice, and Young’s Chapel Church Family.